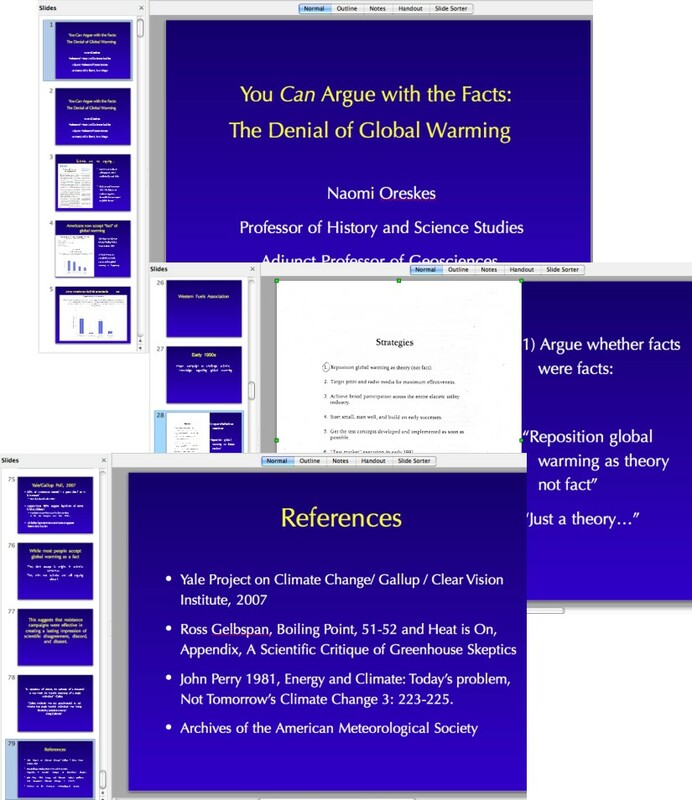 When I say there is only one source for the idea that a fossil fuel industry conspiracy exists where skeptic climate scientists are instructed and paid to lie to the public about the settled science of catastrophic man-caused global warming, I’m not exaggerating in any way. 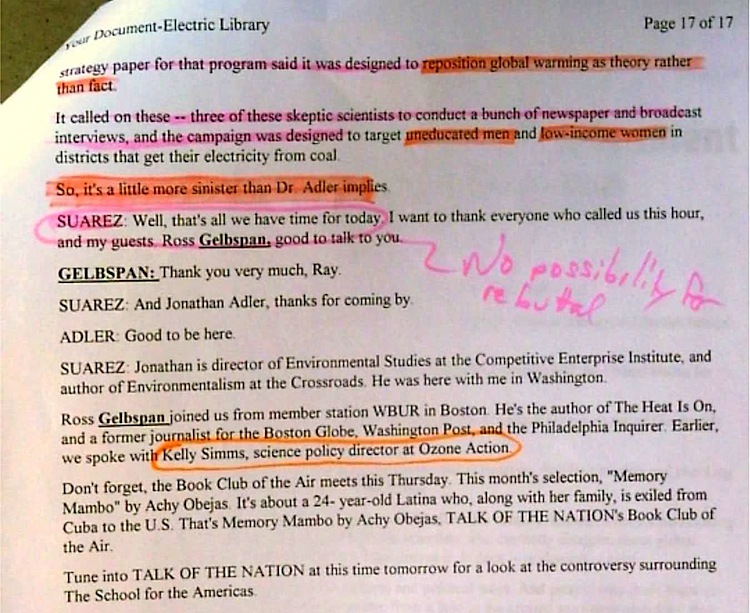 Today, I offer a one-two punch: first, part of a presentation at The 2015 Conference on Communication and Environment in Boulder where I will highlight a particular line with red letters which inadvertently proves my point, made by a “doctor of Rhetoric and Composition.” Then, a days-old video I was alerted to which features not only a couple of the usual suspects whose efforts to smear skeptic climate scientists date from nearly a decade / nearly two decades back, but also a line seen within the video dating from the 1991 origins of the smear. 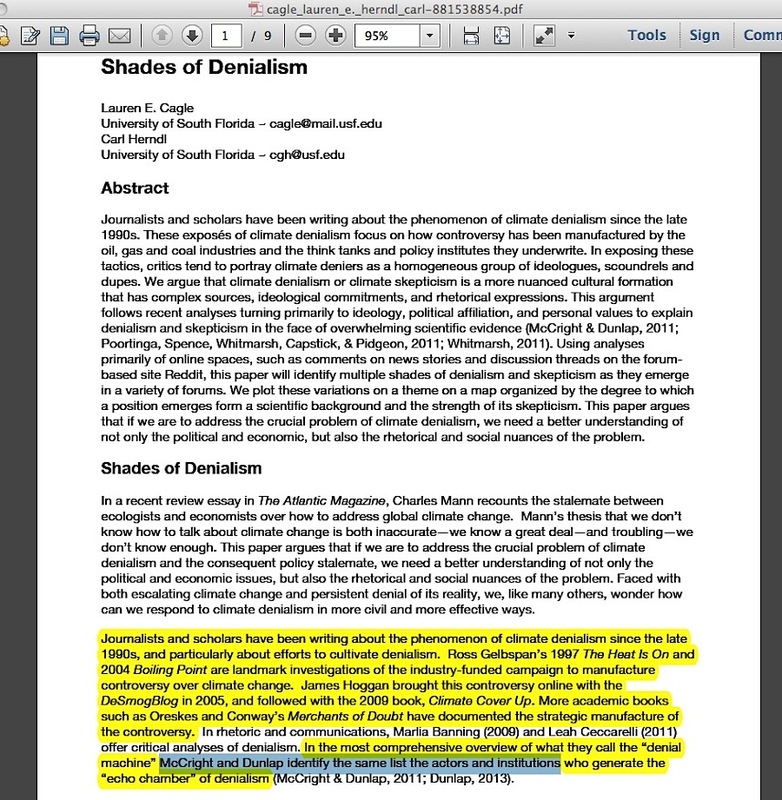 Journalists and scholars have been writing about the phenomenon of climate denialism since the late 1990s, and particularly about efforts to cultivate denialism. 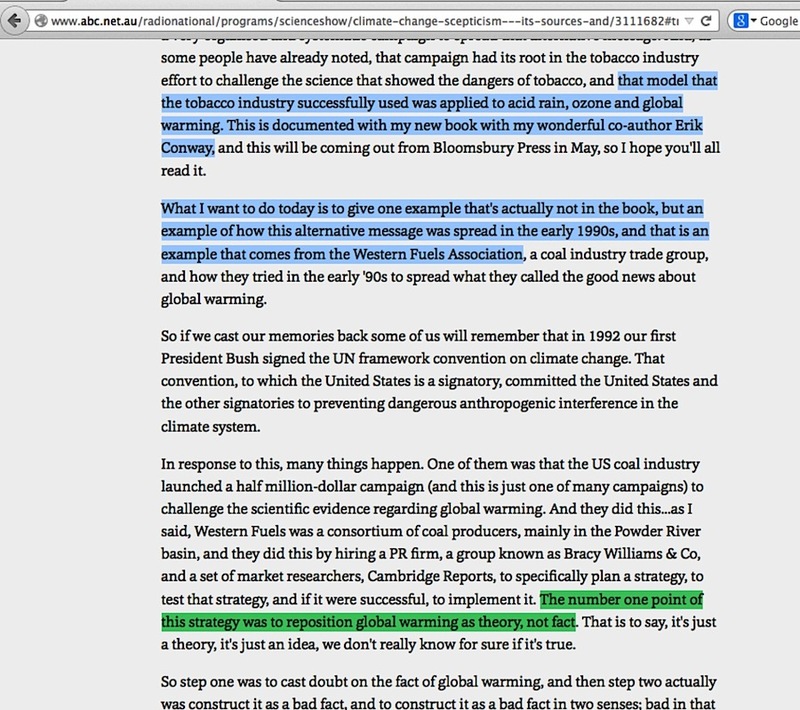 Ross Gelbspan‘s 1997 ‘The Heat Is On’ and 2004 ‘Boiling Point’ are landmark investigations of the industry – funded campaign to manufacture controversy over climate change. 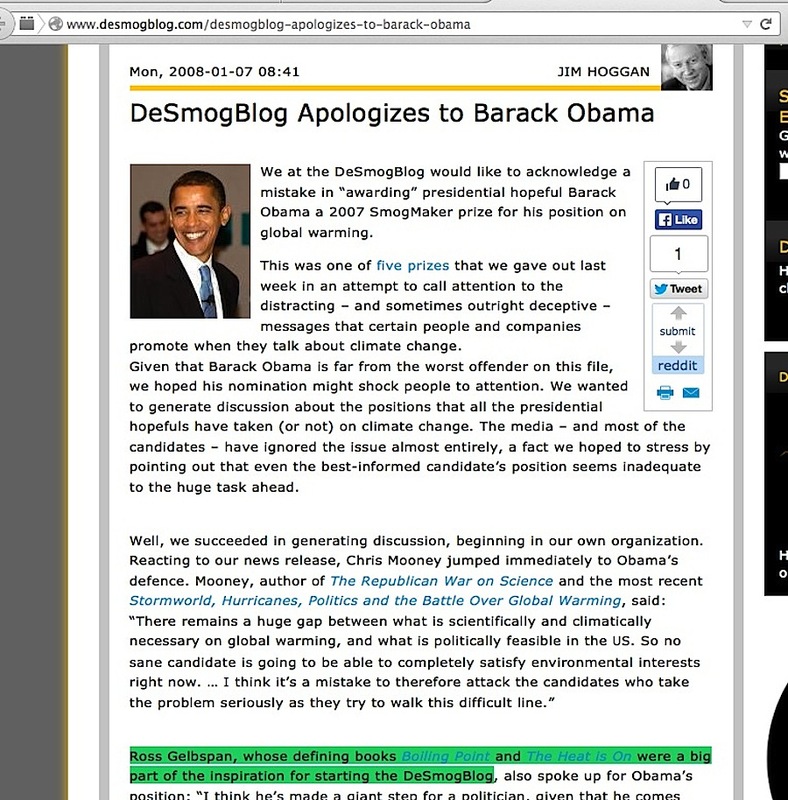 James Hoggan brought this controversy online with the DeSmogBlog in 2005, and followed with the 2009 book, Climate Cover Up. More academic books such as Oreskes and Conway’s Merchants of Doubt have documented the strategic manufacture of the controversy. …. 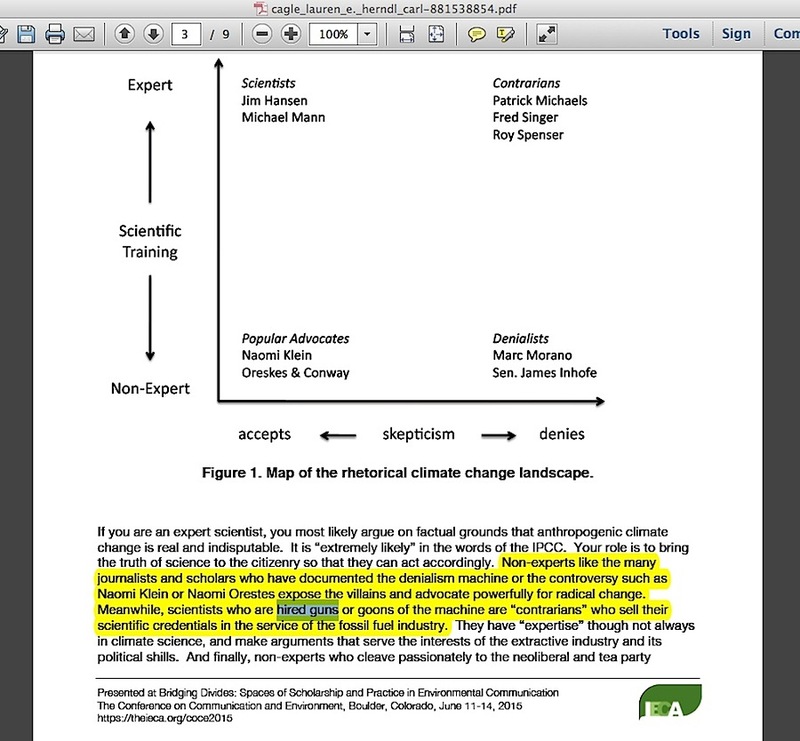 In the most comprehensive overview of what they call the “denial machine” McCright and Dunlap identify the same list the [sic] actors and institutions who generate the “echo chamber” of denialism. 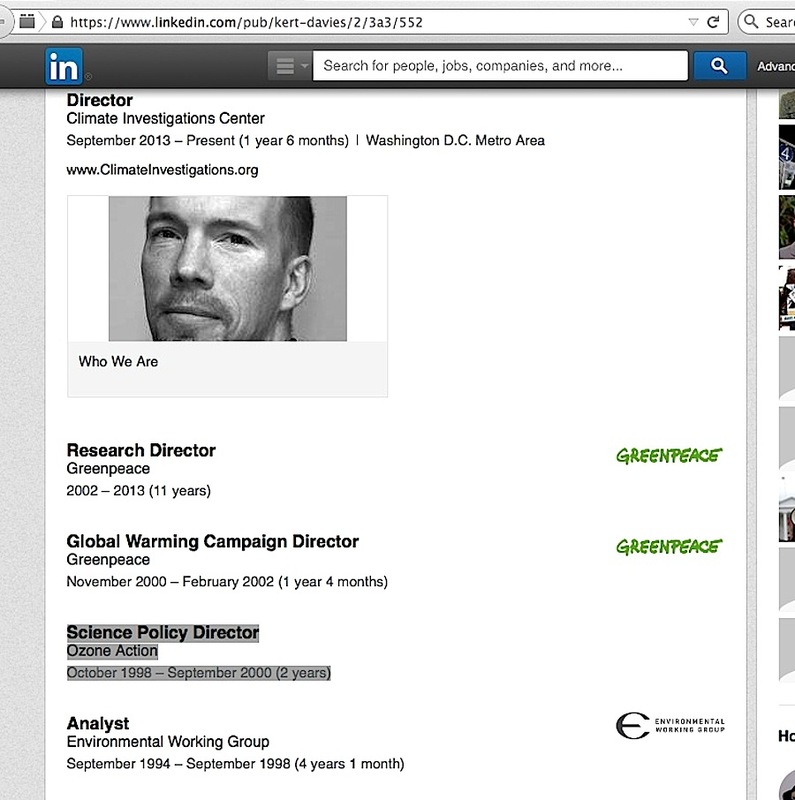 Gelbspan, as loyal readers know from this GelbspanFiles blog and from my articles about him, is the person who is largely responsible for getting media traction to the “leaked memo phrase” reposition global warming as theory rather than fact after it was faltering under previous efforts to portray it as a sinister top-down industry directive instructing skeptic climate scientists on what, when, where, and how to lie to the public. Hoggan is the PR guy who openly said his Desmog site was founded on the works of Gelbspan, while Gelbspan himself says he helped to found Desmog (8 seconds into this audio interview). The reason why McCright and Dunlap identify the same list [of] actors and institutions is because they have no independently corroborated source for it. 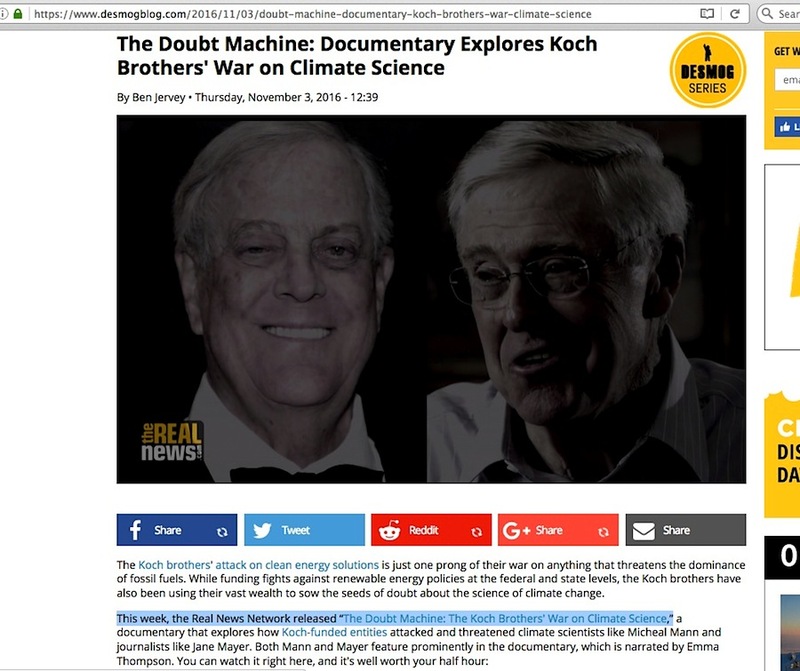 Non – experts like the many journalists and scholars who have documented the denialism machine or the controversy such as Naomi Klein or Naomi Orestes expose the villains and advocate powerfully for radical change. 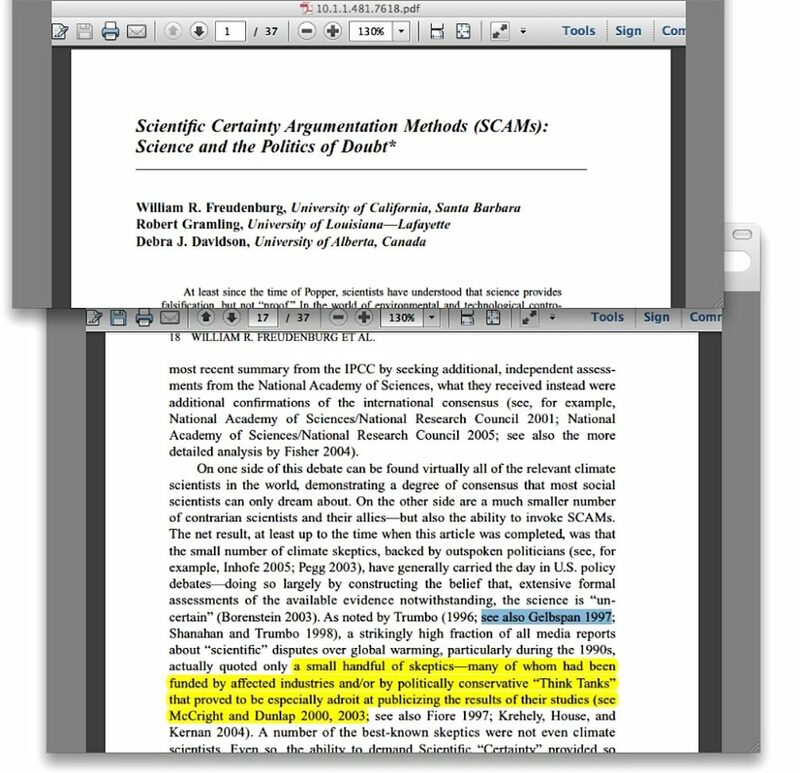 Meanwhile, scientists who are hired guns or goons of the machine are “contrarians” who sell their scientific credentials in the service of the fossil fuel industry. Hired guns? That phrase was what my previous blog post was all about. Now, to pile on. A ‘journalist’ at The Real News Network (TRNN), who I suggested last year reports only half of the real news, put a piece titled “Trump, The Koch Brothers and Their War on Climate Science” online just last week, 9/14/17. 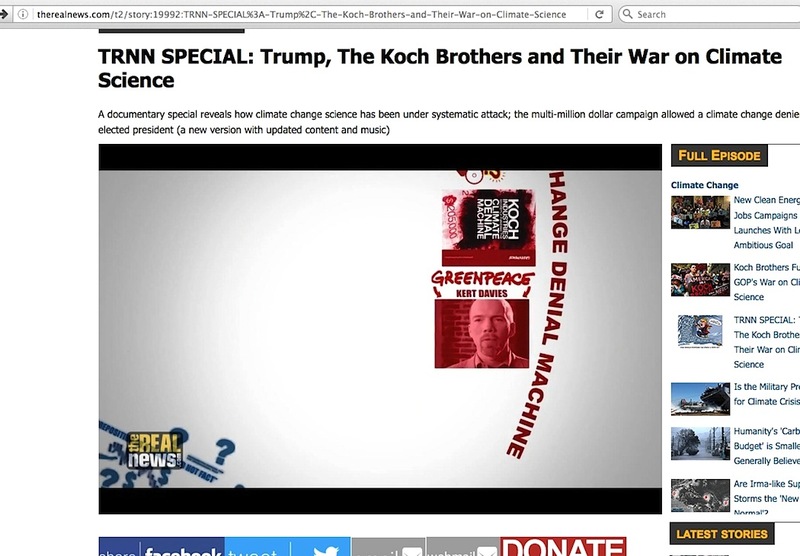 ** The video essentially suggests denial about catastrophic man-caused global warming is bankrolled and orchestrated by fossil fuel industry interests. 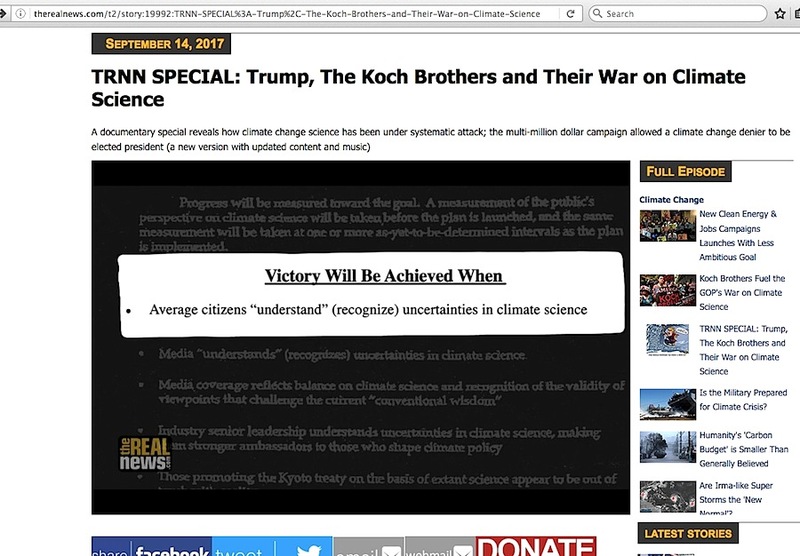 In a lame effort to fill out the TRNN video with other material which looked like fossil fuel industry orchestrating things, a line from the American Petroleum Institute’s 1998 leaked “Global Climate Science Communications Team” memo was highlighted, while the narrator read it: “Victory will be achieved when average citizens understand uncertainties in climate science.” That isn’t a sinister industry directive, it is a basic truism. 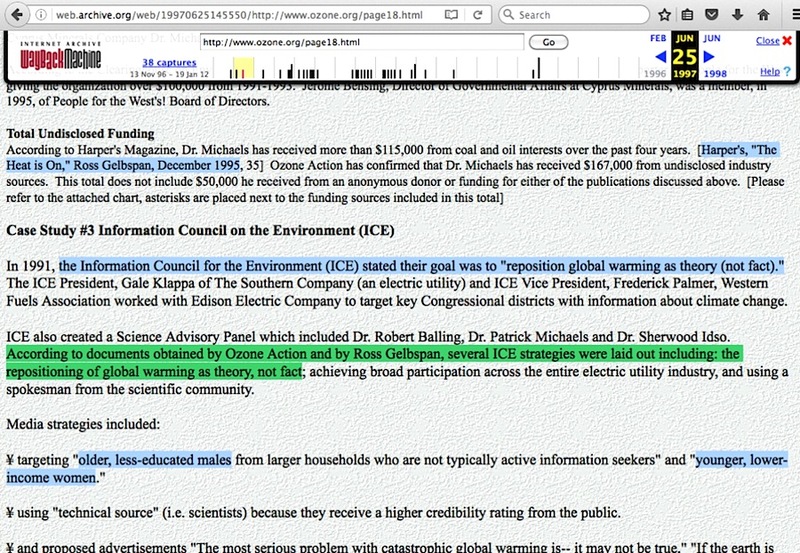 Greenpeace itself would declare the same victory regarding their version of the certainties in climate science, but nobody in their right mind would suggest that is stand-alone evidence proving they commissioned people like the Vice Chair of the IPCC to lie to the public. 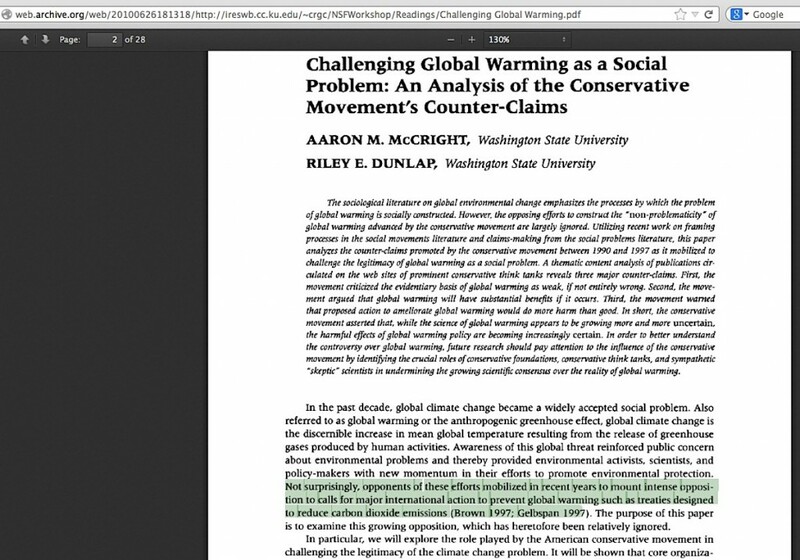 So, once again, it is ever more obvious that the collective lot of enviro-activists have only one source for their unsupportable accusation about a fossil fuel industry denial mating, the worthless set of ‘reposition global warming” memos, and the one guy responsible for gaining media traction for them, Ross Gelbspan. 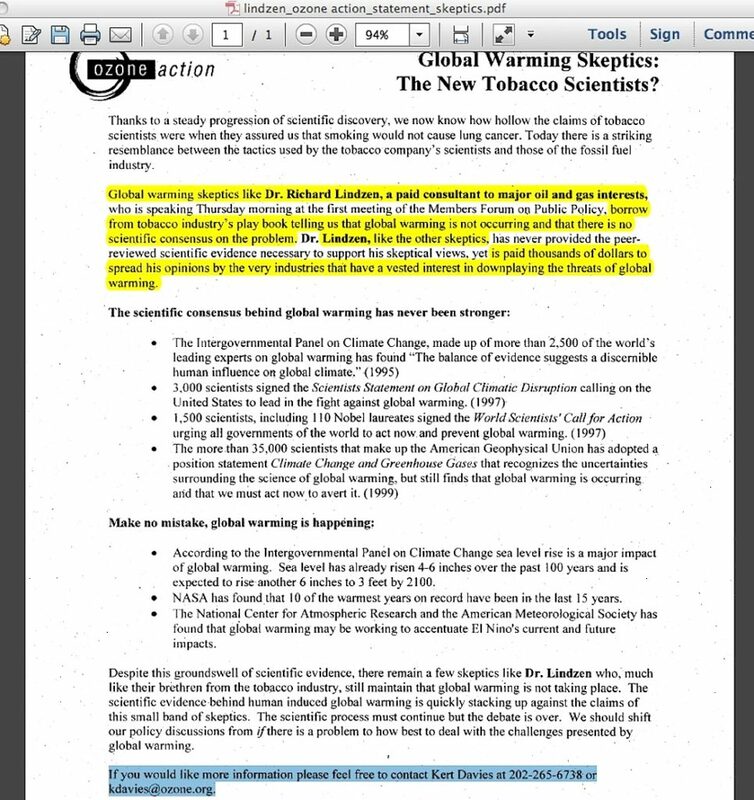 This entry was posted in American Petroleum Institute, Repeated talking points and tagged Kert Davies, Naomi Oreskes by Russell Cook. Bookmark the permalink.